When we got married we wanted a ceremony that was in tune with our own spirituality, but at the same time was something that anyone could feel relaxed attending – and so we created our own. Marriage to us is part of living a spiritual life and we felt that having a spiritual wedding ceremony with symbolic meanings throughout reflected that. A standard wedding doesn’t suit everyone, and for those who want to make their special day more personal and have a ceremony tailored to reflect their own spirituality, it takes just a little extra planning to achieve. It could range from adding a few symbols or words to an existing ceremony to creating an individually designed wedding. Choosing the right celebrant is important and so can be the location, as is finding the right garments and symbols, and not least catering for family and friends, particularly those who don’t share the same ideals. You’ll also have to check laws and regulations to make sure your ceremony is recognized by the state. But it’s worth it, as a spiritual wedding that reflects your own spirituality can reinforce your own values and spiritual principles. If it’s not you that’s getting married but someone you know, they might be interested in custom designing some things in their wedding but had never thought about it. It’s very easy to go along with convention and have the usual wedding ceremony everyone else does, particularly when there are traditions, and that may be fine for most people, but we think it’s nice to add something personal. We held our ceremony outdoors in a circle of standing stones in a grove, which was encased within an large, open pyramid structure. We’d recommend if you’re looking to have a spiritual wedding ceremony, to find somewhere that has an atmosphere suited to the spiritual nature of the occasion. Our marriage ceremony was based on universal spiritual principles and included readings from some of the sacred texts of esoteric Christianity, which included secret and hidden references to alchemy and spiritual marriage. In our view marriage is really a very spiritual partnership, in which the forces of male and female that give rise to all life and creation – the duality of Yin and Yang – are brought together to be used to create the spirit within in the sacred practice of sexual alchemy. This practice has been symbolized and alluded to in many different ancient spiritual teachings, referred to as the transformation of lead into gold (the transformation of the lead of the personality into the gold of the spirit), the “bridal chamber” in esoteric Christianity, and tantrisim in the East. It’s wonderful for developing and expressing the highest principles of love and spirituality. Of course our wedding ceremony is unlikely to be suitable for most people as it’s made just for us, but we’ve put it below to give some ideas, and you may find things in it you could use in your own, or could suggest to someone you know that’s getting married. We’ve included the meanings of the symbols we used, but some of them take more explaining than the notes we have here, and so we realize their meanings still might not be clear. If anyone were to use this or some of it for their own wedding it could be shortened or adapted to include different readings etc. Our ceremony was held inside a circle of standing stones and flower petals. You could conduct your own ceremony in a sacred circle you create before the ceremony begins (with flower petals, in a ring of stones, etc.) or do it without it. The main thing is to have an altar. To follow ancient principles closely, if you do have a sacred circle, it should just be for the groom, bride and marriage celebrant to stand in, and have an altar inside at its Eastern end. We had an altar, four-sided, square and draped with a white cloth. On it was placed a bell, a wand (if a female or male celebrant is conducting the wedding) or sword (if a male celebrant, but not a dagger/knife), two large white wax candles, the wedding rings, a chalice/wine glass filled with red wine, certificates that needed to be signed, and a wooden love spoon placed on the left side. The celebrant wore blue – any color is fine for a celebrant except black (a color used by darkness in ceremonies). Note: The altar symbolizes the philosopher’s stone upon which the spiritual work is built. In the legends of King Arthur, when the young Arthur takes the sword from the stone, it symbolizes the kundalini rising from the philosopher’s stone found at the base of the spine. Incense was burnt at the four points of North, South, East, and West of the circle. If you don’t have a circle it can be done in the area around the groom, bride and altar. The marriage celebrant entered the sacred circle and stood before the altar (whilst we stood outside the altar together, facing the altar). The celebrant took the bell from the altar and rang it 9 times. The celebrant then lit the two candles. Note: The bell is a symbol of the female uterus, just like the Holy Grail, as it forms a grail like shape when upturned. The female uterus is the hermetic glass of the alchemist; the womb of the female is the place from which all of creation is brought forth. Ringing it nine times signifies the work in the ninth sphere, which is alchemy. The two candles are symbols of the two intertwining channels that run along the spine, depicted in the symbol of the caduceus of the winged God Mercury, and in Hinduism where they are called Ida and Pingala. They also symbolize the divine fiery energy of the kundalini that is awakened in alchemy. CELEBRANT: “We call on the Spirits of the West, and the angels of water, to bless this sacred union. May it be nourished by hope. We call on the Spirits of the East, and the angels of air, to bless this sacred union. May it grow through love. We call on the Spirits of the North, and the angels of fire, to bless this sacred union. May it ripen through knowledge. The celebrant then stood with their back to the altar (facing the groom and bride). Note: The four is the foundation that the spiritual work is built upon, symbolizing the four bodies that are purified in the process of alchemy (physical, vital, astral, and mental). It also represents the four colors which the inner energies of the individual turn as they are purified in alchemy (from black, to white, yellow, and then red). All of creation has its foundation in four, such as the four points in the solar year (the solstices and equinoxes), the four directions, the four elements, and the four seasons. The groom and bride enter the circle, right foot first, with arms linked and face the celebrant and the altar. The bride stands to the left of the altar and the groom to the right. Note: The Father, Mother and Son are the three divine forces of the universe which gave rise to all of creation. The have been symbolized as a divine trinity in sacred teachings all over the world, such as Joseph, Mary and Jesus (Christian); Osiris, Isis and Horus (Egyptian); Zarathustra, Anahita, and Mithras (Persian); Amun, Mut, and Khonsu (Egyptian); Prakriti, Purusha, and Brahma (Hindu); Celu, Cariadwen and Hu Gadarn (of the Druids). In marriage, man and woman bring together the forces of God and Goddess to give birth to the divine Son within, symbolically taught in many esoteric texts. The bride takes the cup of wine from the altar and passes it to the groom who takes a sip, and then she sips also. Note: The chalice and Holy Grail is a symbol of the female sexual organs, and the wine the transmuted and purified sexual energies. Water turned into wine symbolizes the transformation of the inner energies of the individual in the practice of alchemy. Jesus performed this miracle at a wedding for a symbolic reason. The wine is the symbol of the Ambrosia and Soma of the Greeks and Hindus, which is the elixir of immortal life. The Holy Grail conferred immortal life upon Galahad in the Arthurian legends. Note: Becoming a son of the bridal chamber is a reference to the birth of the divine son within an individual through the practice of alchemy. The groom takes the bride’s ring from the altar. The groom puts the ring on the bride’s finger. The bride takes the spoon from the altar and the groom’s ring. The bride gives the groom the spoon and puts the ring on the groom’s finger. Note: The spoon is an ancient Celtic symbol of love – it symbolizes the care and nurture a wife gives to her husband out of love. 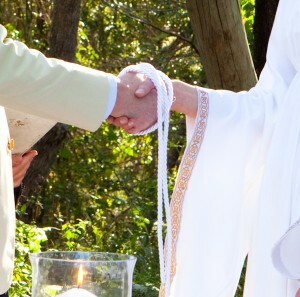 The groom produces a hand fasting cord which is tied either around his waist or around his wrist. The cord should be white and look like rope. The celebrant takes the cord to fasten the groom and bride’s right hands together. This is another ancient Celtic wedding symbol. Note: Alchemy helps a marriage to develop and grow, as love and the spirit blossom from it. A couple can work towards being in harmony in their thought, feeling and will, and consummating their love in higher planes as the kundalini rises. Purusha and Prakriti are the names given by the Hindus to the male and female forces that operate in the universe. Usually to make a marriage legal, there are set vows which must be pronounced. These can be said here. The groom and bride kiss. The celebrant undoes the handfasting cord, which the couple keep. If there is any paperwork to sign to legalize the marriage, then it is signed and the groom and bride leave the circle, and the celebrant follows.